This little rubber helper can hold your highlighters hostage till you need to let em loose to mark those textbooks. Sharpies can find a great home here too. I put a patch on my coin purses and decided the longer coin purse/pencil pouch could use an extra pocket too. 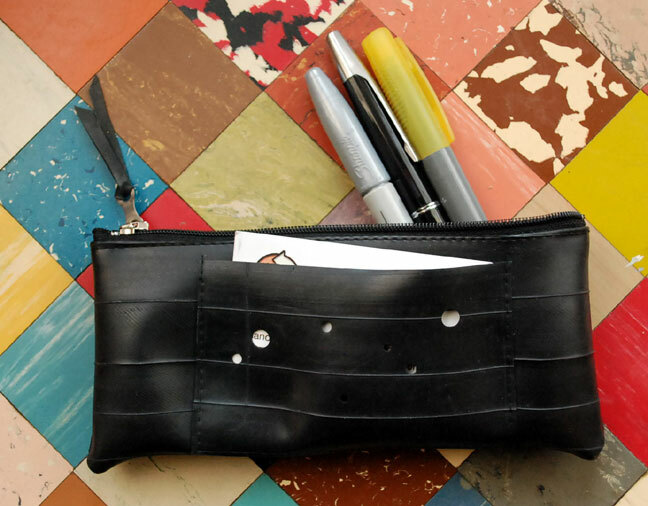 Plus, I love saying Patch Pocket Pencil Pouch. And of course you can always throw in a few coins if you need to. It’s also great for make-up brushes and lip gloss. This silky smooth zipper top bag is made from a recycled bike inner tube and has a recycled chain link zipper pull. The patch pocket can keep your cards separate if you crave even more organization. Like all my rubber bags, these feel great to the touch and each is unique. Some have embossed letters and numbers, some have printing on them, some have none. I punched a few holes in the patch pocket for added style points. Size is approximately 7 inches wide by 3.5 inches tall. Makes a terrific and practical green gift for any pencil pusher in your life. Click the image below to see it in my Etsy shop.